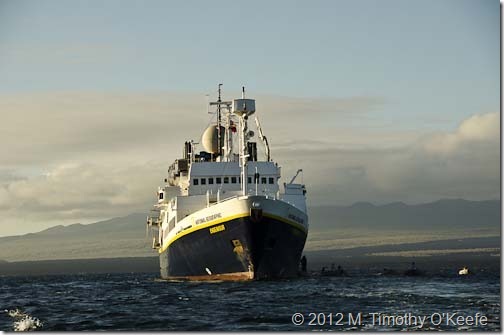 To the west of us, Isabela Island is one of the Galapagos’ youngest islands and among the first we visited. San Cristobal Island, on the other hand, is the eastern most island in the entire archipelago and ranks among the oldest. San Cristobal also is the first island Charles Darwin visited on his Galapagos voyage but, for us, it’s the last stop on our seven-day journey aboard Lindblad’s National Geographic Endeavour. This morning the Endeavour is anchored off San Cristobal at Punta Pitt where we have a choice of a Zodiac ride to look for birds on the island’s volcanic cliff or hike up a dry stream bed that requires “good walking shoes and good physical fitness as it is steep and rather slippery”. 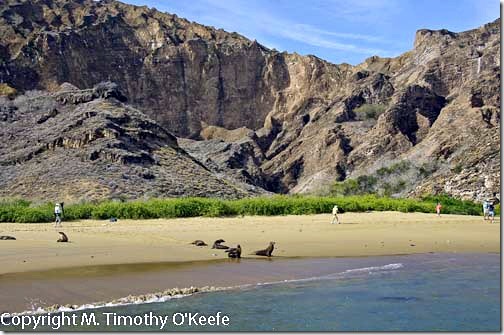 Having seen Tim’s pictures from the rugged beach hike with big boulders at Urbina Bay on Isabela Island, I opt for the boat ride; he takes the hike. San Cristobal is home to all three species of boobies. Since we’ve seen only blue-footed boobies so far–and only a few of them– we welcome the chance for a good look at all three species before we depart for home. 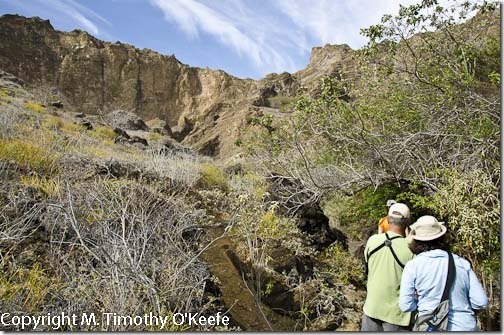 My Zodiac ride will end at the Punta Pitt beach, which is the trailhead for the hike. Once the morning excursion is over, both groups will have an option to swim or snorkel. As I maneuver into the wave tossed panga, I feel a definite wind chill factor. Thankfully, the Endeavour’s expedition leader suggested bringing a windbreaker. Glad I did, despite the awkwardness of zipping it up over a life jacket and then wearing my backpack on top of the windbreaker. It’s too rough to re-do things and put the windbreaker under the life jacket. Jason, our naturalist, tells us about the geologic history of San Cristobal and what to expect in our search for boobies. He explains the contrast between the three birds. The blue-footed booby with its blue legs and feet is mostly white with dark wings and mottled back, a pale head with thin dark streaking and a grayish beak. 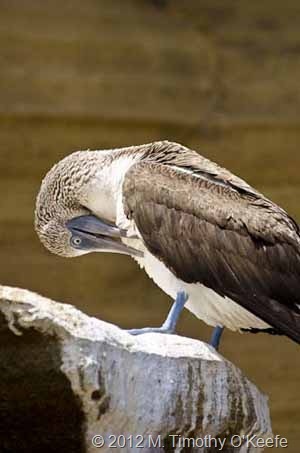 The red-footed booby, the smallest of the three, varies widely in color from mostly white all over except for large brown wings to completely brown. They are the only boobies that nest in trees. The largest booby is the Nazca, with a beautiful white head and body with a dark tail, orange beak and eyes and its signature mask around all of its face, not just the eyes. Also known as a masked booby, the Nazca booby–like so many other Galapagos animals–is recognized as a distinct masked booby subspecies. As the Zodiac navigates around a large rock formation, a bull sea lion bellows out to a female hidden in the crevices. Perched high above the male sea lion is the first Nazca booby of the day. At the same time, red-footed boobies glide over us. Taking decent photos is almost impossible–the birds flying, the Zodiac rocking and everyone in the panga moving around trying to see it all. Jason, trying as usual to ensure his passengers have the best views, asks the Zodiac driver take us through a narrow channel circling the shoreline to reach the beach at Punta Pitt instead of simply retracing our wake. The ride offers lots of views of nesting birds . . . until our Zodiac motor stalls out. Unfortunately, it happens to be low tide and the channel is too shallow for us to pass through. Without power, the waves heave the Zodiac against the rocky shoreline. We start playing musical chairs, moving back and forth in an attempt to shove the Zodiac off the rocks. The tide and wind fight against us but we make progress. Eventually, we’re able to push the craft into deeper water so the motor can be lowered back in the water. The engine starts immediately; we slowly back out of the channel. What an unexpected adventure! After passing more nesting boobies on San Cristobal cliffs, the Zodiac edges onto the beach at our Punta Pitt landing. It turns out the beach here is being patrolled by a bull sea lion who is not at all happy about having guests. He swims back and forth parallel to the shoreline, barking warnings at anyone who steps into the water. 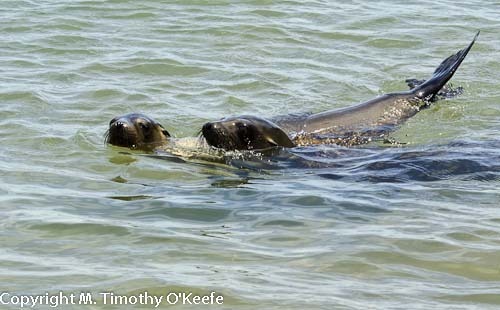 At the same time, just a few yards offshore a pair of lively sea lion pups porpoise and play, ignoring the agitated adult. Several people decide to ignore the big sea lion’s aggressive manner and enter the cold water to swim. 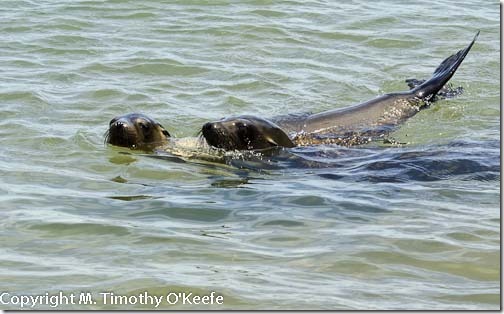 The sea lion pups befriend a snorkeling couple and frolic beside them. No longer distracted by the sea lions, I finally notice how the beach literally sparkles in the sunlight. The glittering sand seems to have jewels ground into it. Not diamonds, of course, but a mineral named olivine, a magnesium iron silicate, that makes this sparkling beach truly spectacular. 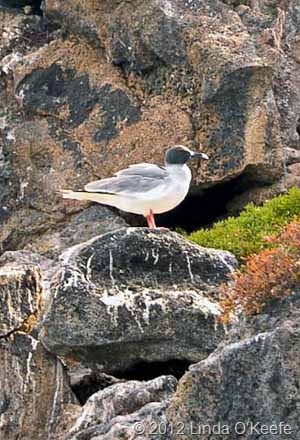 A blue-footed booby happens to be nesting on a cliff just above the beach. Tim takes pictures of the booby, noting it’s the closest he’s been to a bird all morning. The birds he saw on his hike were quite far away; he says he spotted only two distant red-footed boobies but no Nazcas. Beyond the nesting blue-footed booby are several tidal pools filled with some of the brightest colored Sally Lightfoot crabs we’ve seen the entire trip. 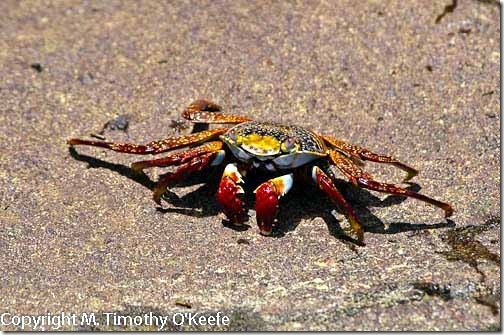 The stationary crabs make the best photo subjects of the morning. Zodiacs begin making trips back to the Endeavour but we’re in no hurry to leave the beach. Eventually, the last hikers return from the mountain, almost 45 minutes later than all the other groups. Tim shakes his head. “Poor people had ‘Chatty Cathy’ for a guide. Now they’re going to miss any beach time, just as I did when she was my guide that one time on Isabela. She can’t go 10 seconds without hearing the sound of her voice.” No need to dodge her anymore since this is our last shore landing. During lunch, the Endeavour sails from San Cristobal to Leon Dormido, a nearby landmark. 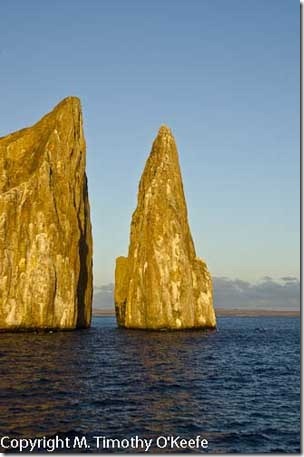 Leon Dormido, which translates as “sleeping lion” in English, is most commonly called Kicker Rock for reasons I never learn. This isolated rock outcropping is actually the remains of a volcanic tuff cone that split into two towering pieces. 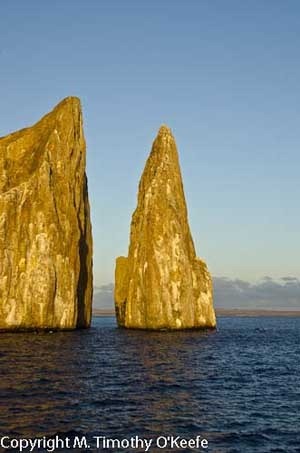 The Endeavouranchors the National Park regulated distance from Kicker Rock, the last chance to snorkel in the Galapagos. 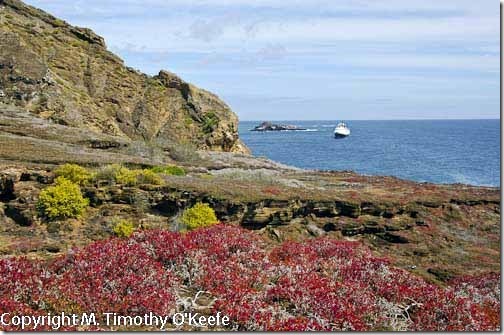 The water here is supposed to be more than 100 feet deep and filled with excellent marine life. I feel guilty about not snorkeling yet, but I’ve been waiting for a beach to snorkel with sea lions, perhaps the most popular Galapagos experience. Only a few days earlier I realized our itinerary doesn’t include the island best known for this. Late in the afternoon, the Endeavour lifts anchor and slowly moves toward Leon Dormido, which we are supposed to circumnavigate several times just prior to sunset. The late afternoon light is soft and luminous and most of the ship’s passengers are on deck. Suddenly, in the distance, we notice spray erupting from the sea. 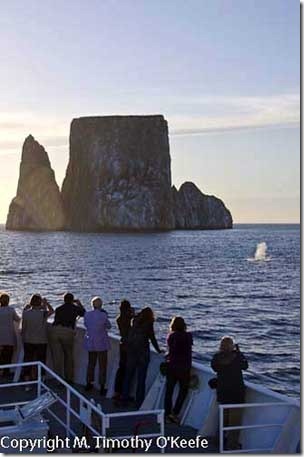 Bryde’s whales, the captain announces. What could be a better finale than this? One whale breeches and another rolls only about 50 yards from the Endeavour’s bow. Just two people were lucky enough to catch the breaching action on camera and I wasn’t among them. But at least I was close enough to witness it all and catch a few frames of the animals. That evening, Tim and I admit to each other we are not ready to leave the Galapagos just yet. We both wish we could stay on the ship for another week, especially since Lindblad’s Endeavour will visit an entirely new group of islands over the next seven days. 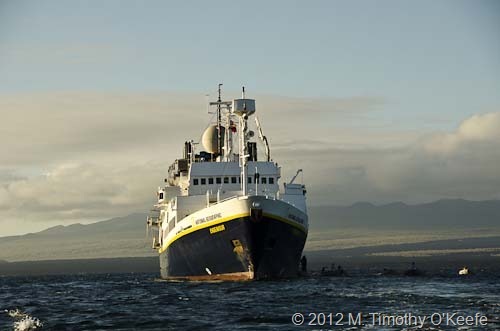 It takes the Endeavour two weeks to circuit the Galapagos, so a one-week cruise is just part of the entire expedition. Although we’ve seen scores of sea lions, hundreds of birds and at least a thousand marine iguanas, we’d be happy to see a lot more of them in next week’s settings.